To me, Fulbright is not just an academic opportunity, but also a chance to develop mutual understanding between cultures. Despite the academic load of the Fulbright Program, I try my best to make the most of the experience through activities such as volunteering. Volunteering is the best way to truly immerse in a culture, and thanks to the help of the One to World non-profit organization in New York City, I managed to do that through many opportunities such as socializing with seniors and becoming a global guide. 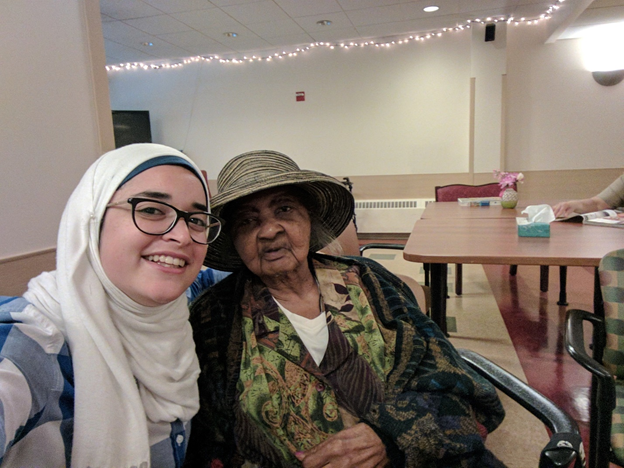 The Socializing with Seniors event was a unique experience as it introduced me to a different sector of this diverse American culture and allowed me to look into the world of a different generation who faced different struggles. The opportunity to hear their stories and to talk about the similarities and differences between Egyptian and American culture taught me so much about the American culture and my own. Spending the day with them meant a lot to both the seniors and me. 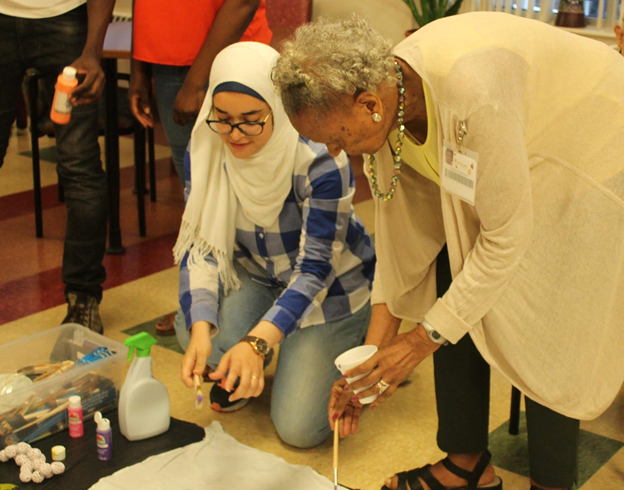 Having company really helps them to feel younger, and we had lots of fun painting, playing, sharing stories, and even dancing. I would like to thank ArchCare Senior Life Center for their amazing efforts and for allowing us to have such a wonderful experience. If my first volunteer experience was about “the past,” my second was more focused on “the future.” Global Classroom is an amazing program organized by One to World that trains and connects international students to New York City schools in order to be global guides and share their cultures with an interactive themed presentation. 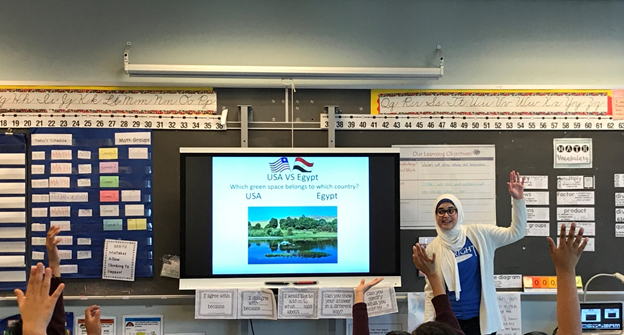 I had the honor to be accepted as a global guide and delivered my first workshop last month at a school in Queens under the theme “Taking Care of the World,” in which we introduced the issue of shrinking green spaces in a simplified manner, shared about Egyptian culture, presented similarities and differences between both cultures and how they handle global issues, challenged stereotypes, and engaged the students to think and be aware of possible solutions. 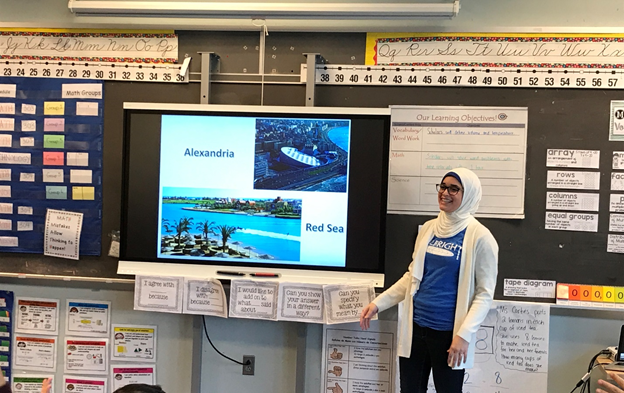 The third, fourth, and fifth grade students were then required to present the issues that they were exposed to from all the global guides in an impressive, lovely dialogue presentation which I returned to watch at the end of the semester. The global guide experience taught me how schools in New York City work and greatly inspired me when I saw the knowledge of the young students and how diversity broadens their minds. I also enjoyed the opportunity to share my own culture and history with them. These kinds of activities truly enrich the mind and spirit as they allow me to learn from different communities as well as to exchange ideas, to inspire and to be inspired. They serve as a great source of motivation when you see what you’ve learned being fruitfully applied, and also help develop another sets of skills that people usually ignore such as communication, presentation, and creativity. I am so grateful to be part of these opportunities as well as to learn about American culture from different levels while sharing my own culture at the same time. I truly hope that I left some kind of positive impact on those great people’s lives as they have left such a deep impression in mine. It’s in my nature to seek such volunteer experiences and extracurricular activities. However, being a Fulbrighter made it much easier for me to be introduced to such opportunities, sometimes even without the effort of looking. As a Fulbrighter, I receive many opportunities to pursue through email, which is very convenient with my tight academic schedule. Being a Fulbrighter opens up lots of opportunities like these and I really encourage everyone to seek their local Fulbright association and ask to be a part of such enriching experiences. Fulbright is not just being academically advanced, it’s a very enriching experience that opens the mind to new cultures, communities and prospective. It introduced me to many opportunities including cultural exchange, giving back to the community, and being a global citizen that promotes mutual understanding. Haidy graduated from Temple University with a degree in Pharmaceutical Sciences in 2018. She is from Egypt. Read more Fulbright stories here.